When you sign into When I Work, you will be on the dashboard that lists the "Available Open Shifts." 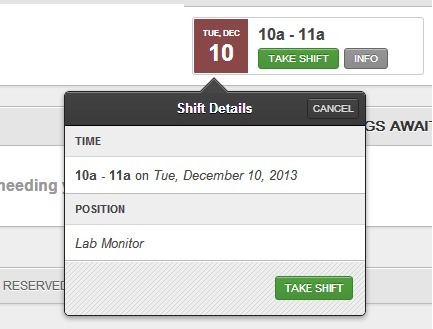 If you mouse over the date or Info of the available open shift, you can see details about which position is available. You can click on the "Take Shift" button to take the shift. If you want to take a shift from the list of "Available Open Shifts" listed on the dashboard, you will need click on the "Take Shift" button. You do not need to mouse over the date unless you want to see more information. You can also take an "Open Shift" by going into the schedule. You see the list of "Open Shifts" at the top of the schedule.